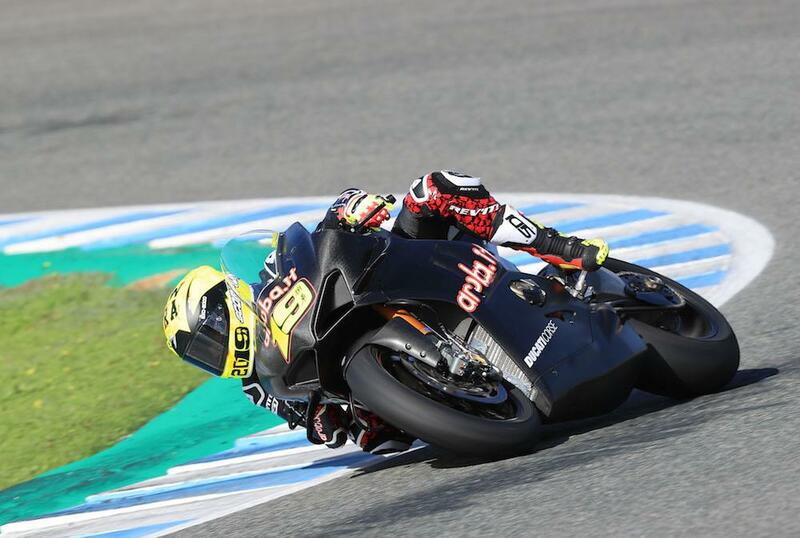 While many expected MotoGP exile Alvaro Bautista to perform as he moved to Ducati’s World Superbike team next year, the Spaniard impressed with just how quickly he seemed to adapt to the production-based class as he made his debut aboard the new Panigale V4 R at Jerez this week. The Spaniard ended his first day on the bike, and first day on Pirelli tyres, just 0.3 seconds off four-time World Champion Jonathan Rea and after a slightly tougher second day with two crashes, one through no fault of his own, he was just 1.1 seconds down on the reigning champ as he continues to learn his new environment. “The character of this bike is similar to MotoGP it just has less power. This bike, you have to ride it more like a 250cc, more speed in the corner and less aggressive with the gas because otherwise if you are aggressive like in MotoGP then the bike starts to move a lot and it never stops so you have to be very careful with the gas in order to make the bike stable. It is a bit different but I enjoyed it because it reminded me of the 250cc but with more power. I have had to change my style a little bit because of this and when you ride more and more you feel like you have to ride like that so it is not very difficult to change my riding style. Especially because in 250cc I was fast so for me it is quite easy to adapt my style in that way.